Necklace "Power of the Creation"
In the pendant of this necklace is a beautiful and rare jewellery stone - malachite stalactite. Stalactite forms when a drop of water comes thru limestone cave ceiling and leaves behind a thin ring of calcite. Each subsequent drop that forms and falls deposits another calcite ring. By repetition of this process the length and thickness of the stalactite is increased. An average growth rate is 0.13mm (0,005 inches) a year. Malachite has been used since ancient times. It was believed that it protects the bearer from the evil eye and heals stomach-related diseases. Malachite is a powerful protective stone, it strengthens our natural energetic shield and fulfils the aura with positive vibes. It also activates the “radar” that can detect danger. 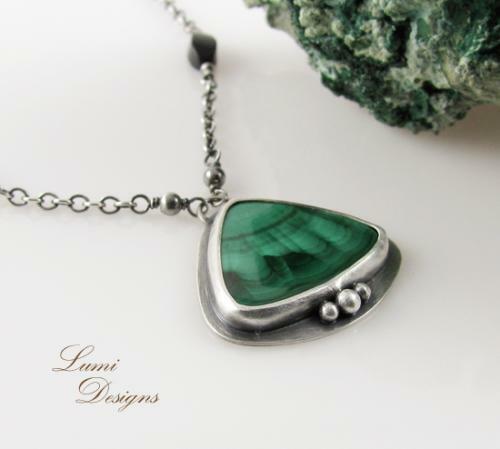 Malachite emits energies necessary for the heart, both the emotional and physical heart. This crystal opens us to unconditional love. It helps to retain a balanced and positive state without taking on the emotional burden of other people. Malachite helps us remember that we are co-creators in this world and that we carry endless opportunities. Fate is just an illusion. It gives us strenght and indicates the necessary steps to fulfil our dreams. Malachite is useful to those with many ideas but limited ability to implement them. It shows how to use your power and might in the best way. It also encourages taking risks and going along with the changes, breaking unwanted ties and stale patterns. Black tourmaline purifies negative energy and changes it into usable energy. This crystal protects against cellphones, electromagnetic waves, radiation, psychic attack and all kinds of negative energies. It is especially useful for the people with high levels of stress in their lives. Black tourmaline helps to get rid of negative emotions, like anger and jealousy.